"Reconquísta?" Or Road Back To Oppression? Race based militant nationalism and Socialism is still warmed over Nazism, no matter how you present it. This article was published in the California Rifle and Pistol Association's magazine, "The Firing Line" in the May, 2002, issue. My deepest respects and regards to the men and women of the CRPA for this honored opportunity to address their forum. As a white boy, who grew up immersed in the Southern California Mexican/immigrant community and working within a ethnically dominated industry, I have always been a little more sensitive to race related issues than most people who comprise my racial demographic. Growing up immersed within a particular ethnic community has given me opportunity to keenly observe the inner workings of a culture quite different from my own. Yet, I cant say its different from my own to any great extent, because I grew up not knowing much of anything else. As far back as I can remember, the community of Mexican heritage has always accepted me with no reservations, treating me graciously as one of their own. On occasion, I have sensed faint hostility towards me because of the color of my skin, but have always attributed it to a very small minority within this community. Every society has them. I have attended their weddings, been invited to their gatherings and fíestas, been invited into their homes. I have listened to their compelling tales as those who have immigrated from Mexico have described the hardships they have endured to come to "El Norté" on their quest to find a better life. I have been educated at their hand on the corruption and despair they withstood back in their homeland. I have then listened happily as these, my friends, have rehearsed the details of their US citizenship test and swearing in as they have made their decision to become a citizen of America. I still have one of the small American flags that was given to one of them at the ceremony in my work truck, a small gift that has a weighty symbolism. It symbolizes freedom to them, as it does to the rest of the world. Growing up this way has been an invaluable experience, a life seasoning that very few gríngos has experienced in such richness and depth. Over the years, on innumerable occasions, I have been entrusted with the peculiar secrets and hidden dreams just such a community holds as they seek to find that self-reliance and independence that is part of shouldering the responsibility of living under that freedom. And this güerro has been queried many times by these people concerning what is true and what is not true concerning gun control/confiscation schemes being implemented by the current state of Californias' Liberal/Socialist administration. Many, many of my friends of Mexican heritage are lawful private gun owners. Many of these friends are also immigrants to this nation. The decision they made to come to this country was not one that came easily. It was difficult for many of them to get here, let alone leave behind their families, friendsthe birth place of their very heritage. Its alarming the majority are remarkably politically unsophisticated, not understanding the hows and whys of the founding principles of the nation and for what reasons America is free and prosperous, just understanding that it is. Most, if asked if they understand the foundational truths of the US Constitution or the differences between capitalism and free markets and socialism, will simply shrug in puzzlement. That being so, after they traverse the border, in the natural propensity to incline toward people of their familiar culture, they are absorbed into the burgeoning and socially exclusive immigrant population throughout California and the Pacific Southwest. Within this flourishing community, the socialist philosophy based movement, termed El Reconquísta or El Caúsa de Aztlán or simply, referring to cultural sovereignty, El Movímíento, has taken hold. These movements and philosophies can be traced back in origin to East Los Angeles during the myriad turmoils of the activism of the sixties. Adherents to this movement purport to take back the lands of the Pacific Southwest which were appropriated by the US government after the 1846-48 Mexican/American war and the signing of the treaty of Guadalupe Hidalgo in 1848. This socialist movement and philosophy has obtained substantial influence and support in recent decades from within the Mexican immigrant community, with many of their leaders being elected, through the Democratic party, to office in the state. Understandably so. With the majority of the immigrant populace having no background or experience in political affairs, they are a captive and fertile audience for the socialist indoctrination and propaganda which flows from Spanish speaking TV and radio. Having no background to compare this ideology against, most are intellectually powerless against its intoxicating influence. Im amazed at hearing a lot of the terminology employed by these activists being used by inconspicuous people on the street. This, with the fervent voter registration efforts by the activists driving these movements, and the results were inevitable. First, these militant activists and socialist college professors most certainly have my begrudging respect. Their skillful exploitation and manipulation of their constituencys lack of political savvy and sophistication, their fear and apprehension in trying to function within a high-tech, unfamiliar culture, and their fierce pride in their nationality and heritage, has been flawless and complete. Their enthusiastic use of the PC snarl word, racist and bigot hurled against anybody who would oppose their dangerous and biased philosophies has become a potent club wielded with revolutionary zeal. Their adroit manipulation of peoples natural envy of others and skewed, ambiguous opinions of whats fair is textbook Socialism. And the final results, most certainly the current political landscape in California, have certainly taken the complacent Conservative community by absolute surprise. World historians know Adolph Hitler utilized and exploited the same militant, revolutionary nationalism to advance the National Socialist German Workers Party (the Nazis) in his rise to power in Germany. Hey, it worked for him! Hitler also implemented the same incremental gun registration and confiscation schemes, to disarm the public, that are being approved by the socialist Democrats in Sacramento today. The tactics they both used to advance their agenda and interests mirror the other perfectly; a new race superimposed over the same old rhetoric and ideology. Frighteningly similar. In light of this historical and modern day fact, I point this out to my many friends of Mexican heritage who are being wooed by this emotionalism and nationalistic rhetoricindeed as they now strain under the tax burden laid on them, like the rest of us, by the wealth redistribution policies of the very socialist Democrats they support. Even the most politically unaware among them understands the basic principle that the ruling elite, these socialist utopians, gradually outlawing the fundamental Constitutional right of private gun ownership, is a overt attack on the one cornerstone right appropriately characterized as the teeth of the Constitutionthe freedom and opportunity they came here for in the first place. Even the most innocent among them still retain the memories of the notorious political corruption, despair, and violence that motivated them to flee from the south. It is common knowledge that private gun ownership is outlawed in Mexico. Yet, these socialist activists and politicians are going to attain a reconquísta of the Pacific Southwest on their behalf? To what end? A vague and indeterminate social justice for them alone? Much like the Germans had at the expense of the, then unarmed, Jews and other undesirables? As one of my friends of Mexican heritage commented, to import the poverty and despair of their native land? 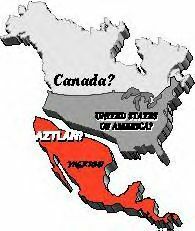 Even if Mexico had retained control over the "disputed" territories of mythical "Aztlan," it would only have expanded the greater nation of Mexico, and the oppression and hopelessness these people are fleeing from! This has little to do with social justice, and much to do with political power. That is one of the inherent risks of living in a free society. To be sure, personal responsibility for personal safety, unshackled by governmental intrusion and paternalism; indeed, the absolute right to keep and bear arms a hedge and check against the arbitrary and repressive totalitarian state. Reconquísta? Or road back to oppression? You decide. But know that history proves when socialist government moves to disarm the peaceful and law-abiding, tyranny is not far behind. Political elitists and demagogues fear the peasants who own guns; the predatory criminal community, which laws dont affect, doesnt care either way. If they accomplish this perilous ban in California and subjugate and enslave the populaceof all racial backgroundsthe true reconquísta will finally be complete. That of true freedom and liberty. It sure wont be the utopia they would lead you to believe. "Reconquista? Or Road Back To Oppression?" © 2000 Michael A. Baker All Rights Reserved. NOTE: Author does NOT wish to engage in long-winded email debates!